Epson takes the 3 most popular scanners and announces New Year special pricing for the Epson DS-510, Epson DS-760 and the Epson DS-860 document scanners. All of the Epson scanners ship with Epson Scan Software, ISIS & TWAIN Scanner drivers, EMC Captiva Capture Pro Software, USB Cable, Power Cord and the provided roller kit to get you up and scanning in no time at all. All of the Epson Document Scanners ship with a 1 Year Manufacture Warranty. 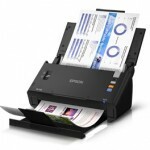 If you are looking for a front office scanner or a scanner for the home office “SOHO” look no further. The DS-510 is a popular scanner for the low end scanner user. The scanner scans at 26PPM and duplex (Double Sided) Speeds up to 52 images per minute. The scan feeder holds up to 50 sheets of paper and can support up to legal size document scanning. Epson DS-760 & the Epson DS-860 are very much alike for features and specs. The only difference in the two document scanners is the SPEED. 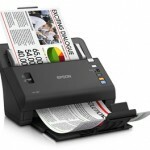 The Epson DS-760 has a scan speed up to 45 PPM and the Epson DS-860 will scan up to 65 PPM. Both are Duplex scanners and support B&W/Color scanner up to 600 DPI Optical Resolution. The other most distinctive difference would be the Daily Duty Cycle. The Epson DS-760 is rated at 3,000 pages per day. This is not bad for a scanner that scans at 45 pages per minute. The Epson DS-860 is comparable to the Fujitsu 7180 at 6,000 pages per day Duty Cycle. The only other scanner close to this unit would be the Canon M160II with a Daily Duty Cycle of 7,000 pages per day. People who purchase these types of scanners are usually scanning more paper than the small office home user. These users are scanning at the front desk or in a department that requires day to day scanning to maintain thousands of pages per day from stacking up on the desk or in a file cabinet. You could very well use these types of scanner in a medical practice (Healthcare), schools (Education), small law firms (Legal), (Manufacturing) small company or departmental scanning for large corporations. Feel free to call Scanner One, Inc. for any of your document scanner service needs. We can be reached Toll Free 888-395-8570 and we offer Epson Replacement Roller Kits for all of the Epson Scanner line. Is the Fujitsu 7160 the “Right” Scanner?